The war with Colombia’s last remaining guerrilla group, the ELN, has waged since 1964, but has a history that began in the 19th century. Violence and civil war have plagued Colombia ever since it declared independence in 1810. The country has had 10 civil wars between 1813 and 1958. The wars were driven by a bitter political conflict between the country’s traditionally secular liberals and the Catholic Church-backed conservatives. This feud goes all the way back to the founding of the country with the Liberator Simon Bolivar and his second-in-command Francisco de Paula Santander, whose followers respectively founded the Conservative Party and the Liberal Party in what became a two-party political system. However, rather than pursuing their individual ideological purposes, these parties often were driven by or catered to the interests of wealthy and powerful families. Colombia’s current president Juan Manuel Santos is, for example, a descendant of independence fighter Antonia Santos and a grand-nephew of President Eduardo Santos. After World War II, more radical leftist philosophies began to take hold in some parts of the country in response to the oligarchical system of government upheld by the two parties. The 1948 assassination of populist liberal politician Jorge Eliecer Gaitan, who many believed would win the 1949 elections, led to a “La Violencia,” a decade-long period of extreme partisan violence that killed an estimated 200,000 Colombians. However, more radical elements of the left such as the communists did not accept this deal between the Bogota political elites, and remained in arms after La Violencia in defiance of the national government. It is from these conditions that the ELN and a number of other guerrilla groups emerged in and around 1964. The ELN was strongly influenced by the Cuban Revolution, like many other Latin American guerrilla movements. In fact, the original leaders of the ELN were trained in Cuba, which had been taken over by Communist dictator Fidel Castro only a few years earlier. Numerous Colombians received scholarships to study in Cuba, but when they left during the Cuban missile crisis in 1962, 22 stayed behind to participate in military training to defend against a possible invasion. Of these, Victor Medina Moron, Fabio Vasquez Castano, Heriberto Espitia, Ricardo Lara Parada, Luis Rovira, Mario Hernandez and Jose Merchan would go on to found the ELN. 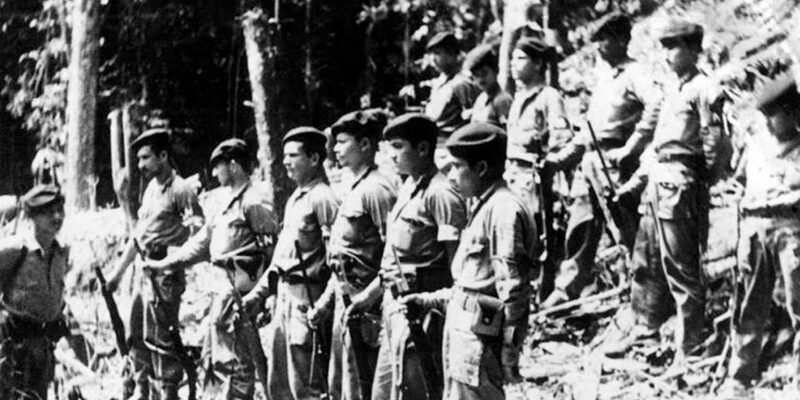 The ELN quietly began preparing their military activity in the central Colombian Santander province on July 4, 1964. Six months later, on January 7, 1965, they carried out their first attack on the village of Simacota, Santander. After the assault, the guerrillas presented a manifesto, explaining their revolutionary purpose and inviting locals to join their group. Among those who agreed were several priests associated with the Marxist-like Liberation Theology that seeks to put the Catholic Church at the service of the poor and disadvantaged. The most famous of these priests was the iconic father Camilo Torres. Among those who joined the emerging group in 1964 was the then-14-year-old Nicolas Rodriguez, know better known as “Gabino,” the highest ranking member of the ELN. In 1966, Torres was killed in his first ever combat with the Colombian military and has since become an iconic martyr for the guerrillas. 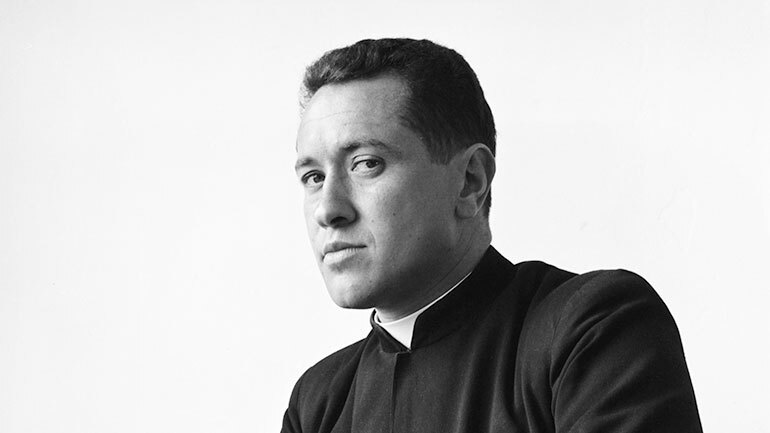 In 1969, three Spanish priests, inspired by the death of Torres, joined the ELN. Among them was Manuel Perez Martinez, nom de guerre Cura Perezor or Poliarco, who became a top commander of the organization until he died of hepatitis B in 1998. On February 5, 1970 the ELN conducted their first kidnapping, which would be their primary source of funding until the group got involved in drug trafficking. In 1973, the ELN was decimated in a military offensive called operation Anori. Over 30,000 army, police, and national guard formed a task force to hunt down the guerrillas, killing 135 of their estimated 200 members. The casualties included the brothers of leader Fabio Velasquez, Marco and Antonio. At the assembly, those held responsible for the military defeat were executed and exiled leader Fabio Vasquez outlined a new strategy for the group from Cuba. However, the execution of members caused major unrest among the the guerrillas and Velasquez was banished from the group on claims he was more interested in promoting the interests of Cuba than those of the ELN. Gabino then took over Velasquez’ leadership of the group. The remaining division within the group kept it from acting coherently and forming a serious threat to the government, which took advantage seeking the first-ever peace talks, but without success. The group remained in relative disarray until the 1980s when a newly arisen drug trafficking industry provided the ELN with considerable more funding, mainly by demanding protection money from the narcos. Additionally, during the in the middle of the decade, oil was discovered in Arauca, one of the ELN’s strongholds, and the group also began extorting local and international oil companies. Thanks to the growing revenue from kidnapping, extortion and drug trafficking, the group reached its peak around 2001 with approximately 4,130 fighters and thousands more supporters across the country, both in the countryside and the cities. However, the entry of the paramilitaries escalated the conflict and, while rapidly expanding its military forces, the ELN increasingly began using terrorist activities and kidnapping. Throughout the 1990s, the ELN was regularly bombing major oil pipelines, even those from which it still drew revenue. On 18 October 1998, the Cimarrones Front bombed the Central Pipeline of Colombia, which was next to the town of Manchuca. The fire spread to the town, destroying 46 buildings and killing 54 people, most of whom were minors. In April 1999, the ELN hijacked an Avianca flight, taking 43 people captive. The next month, ELN guerrillas dressed as policemen kidnapped 186 people from a church in Cali, the largest single kidnapping in Colombian history. Since the late 1990s and in spite of growing their military apparatus, the ELN suffered major territorial losses to the newly found anti-guerrilla paramilitary groups, internal feuds and occasional clashes with the much bigger FARC guerrilla group. Amid the paramilitary offensive, the ELN was able to maintain its stronghold the northeastern in Arauca and Norte de Santander province, and in Nariño and Choco along the Pacific coast. The group lost, however, its strategically important stronghold in the northern Magdalena Medio region that connected its military units from the west and the east of the country. The pressure on the group increased even more in 1999, when the United States agreed to finance “Plan Colombia,” a counter-narcotics offensive that effectively became a counter-insurgency offensive. While fighting the paramilitary AUC and the US-backed Colombian military, the ELN lost more than half of its fighters between 2002 and 2008. As both the ELN and the FARC were facing increased military pressure, they decided to put aside their differences which had previously led to violent clashes between the two Marxist groups. The alliance probably allowed the groups to prevent their own extinction and instead force a stalemate. Neither guerrilla group had the power to overthrow the government and the rebels’ return to traditional guerrilla warfare ended the state’s territorial advances made in the 1990s and the first decade of this century. Moreover, a series of major scandals over mass human rights violations by the military and a global economic crisis forced the US to diminish military aid. In 2011, both the ELN and the government announced their interest to hold peace talks for the eighth time since the group’s formation 52 years earlier. These talks were formally announced in 2014 and were supposed to begin on November 3, 2016, but were suspended over mutual bickering over the release of ELN hostages.